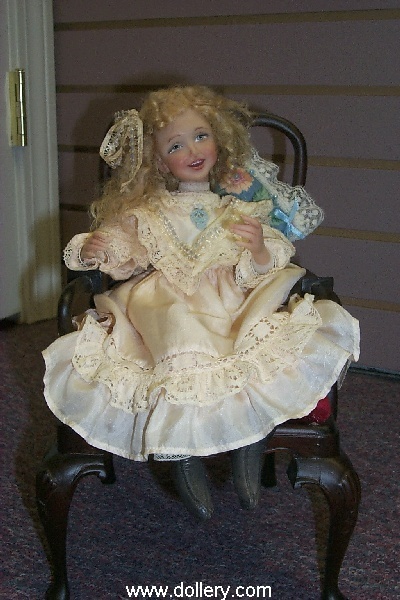 Linda is no longer making dolls but she did attend our shows for many years and we have sold many, many of her dolls. 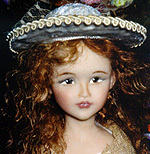 For the last couple of years she has been focused on her paintings versus dolls. She has been probably best known to our customers for her amazing Alice in Wonderland pieces of which we had exclusive to for years. She would do custom orders in a variety of different themes. She has a vivid imagination. 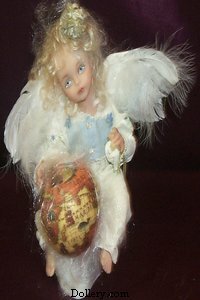 Each doll is a true ooak created in a cernit/sculpey mix. You can still Email kmalone@dollery.com for new available work updates but we haven't had any for some time now. 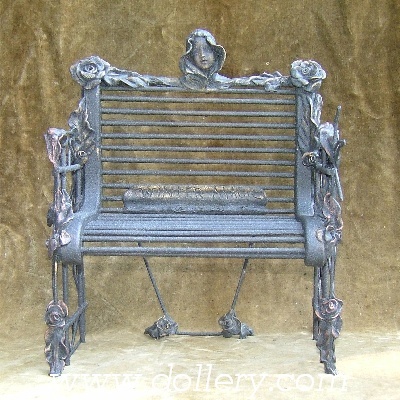 This page is now updated with many other pieces not previously shown on this page (just on our last on line shows). Be sure to scroll all the way down to see all available pieces! We have been honored to have Linda attending our shows year after year for about ten years now. 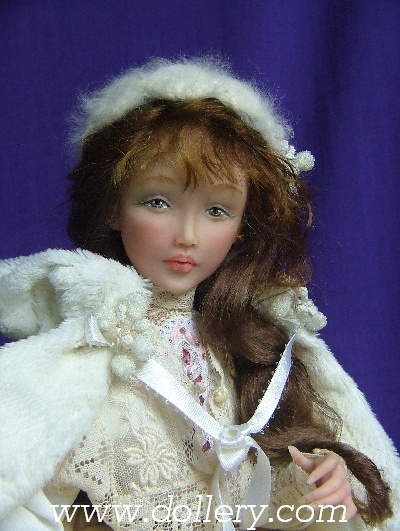 A lot of her work was posted on our previous doll show pages but not on this individual artist page. We have now listed all available work! Be sure to look below. If you see a piece you have fallen in love with that is sold please don't hesitate to email kmalone@dollery.com about special ordering a custom piece similar. Each piece is a one of a kind sculpt but similar themes and sculpts can be ordered. Linda has also given exclusive rights to Alice in Wonderland and she is a master at capturing her! We have two beautiful Alice pieces in stock. You may also request different Alice themes with different specific characters. 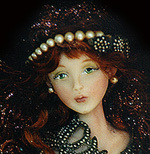 Linda has been well known for over a decade and a half in the doll world for her wonderful one-of-a-kind pieces. Every year Linda comes up with amazing new themes. 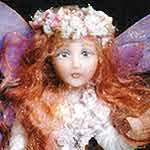 Victorian children, storybook characters, angels, witches, goddesses, mermaids, fairies and more are among the treasures Linda has brought with her to our shows. 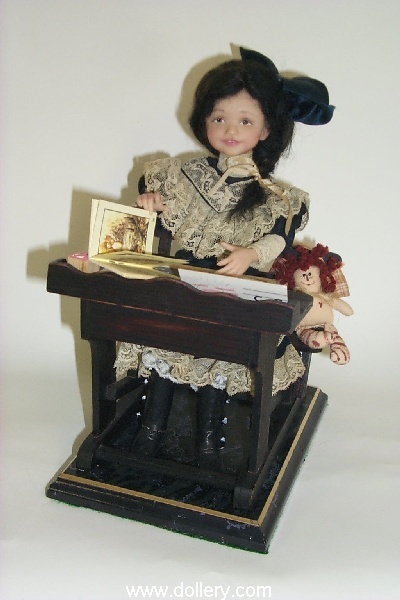 Linda is a world renowned doll artist, has been featured in well over 52 magazine articles and 5 books. Every masterpiece she creates is a hand sculpted one-of-a-kind made from a combination of super sculpey and cernit. Extended layaway is available for most of these pieces. Email kmalone@dollery.com for details! 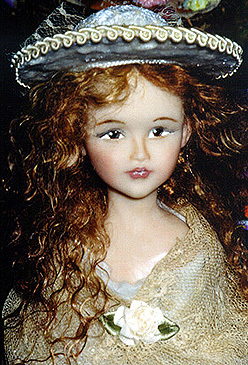 : Linda Kertzman at 1999 Doll Show (28k) .On-line Doll Show Artist Videos from our 18th Annual show is now up featuring Linda discussing her work. We will also have more video from our 19th show up soon. Alice has 2 broken fingers on right hand. See more pictures below and description below. Missing apple in left hand. See more pictures and description below. See description and other picture below. White Winter Magic is a dark haired, elegant woman sitting on a carved park bench with tiny magical fairies dancing the sugar plum dance all around her. 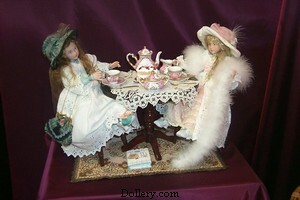 Linda gave the Dollery an Exclusive on her Alice in Wonderland dolls in 2002. We have a couple of beautiful pieces and many other themes to choose from for custom special orders. Price range is $1,298 and up in different sizes and themes. Feel free to inquire. 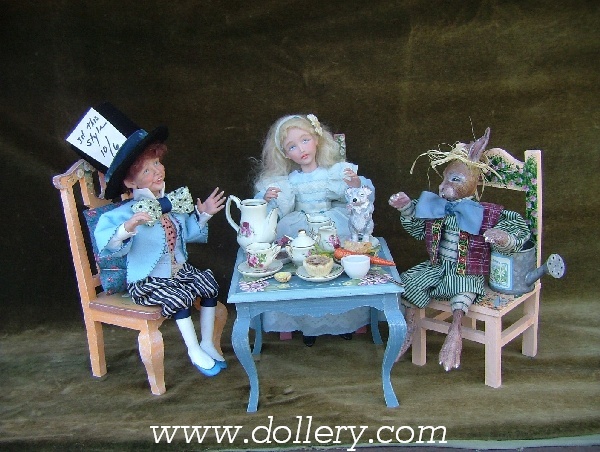 The dimensions on this SOLD piece below were approximately 16" high with Alice , the Mad Hatter and the March Hare all sitting, it was about 16" in width and about 24" wide with the table and four chairs. The price was $2500. 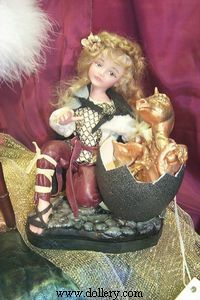 Linda Kertzman at our 2005 Doll Show! One of a Kind, Super sculpey/cernit. 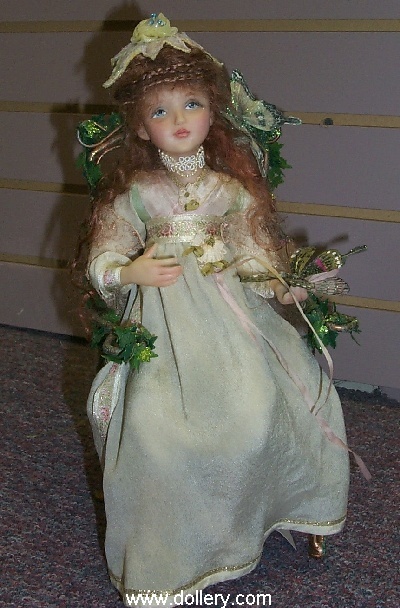 Green painted eyes, blond mohair, 18"H x 8"W x 14"D This elegant woman comes complete with harp. She is dressed in a deep forest green crushed velvet over dress with long slashed sleeves and a cream silk blouse with antique flowers and silk ribbon. She comes complete with high backed wood chair. $1,898.00 - Dollery favorite! Available! 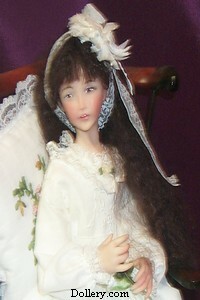 One of a Kind, Super sculpey and cernit, green painted eyes, red mohair, 19" on Pedestal. Super Sculpey & Cernit, each one of a kind crystals and color combinations. 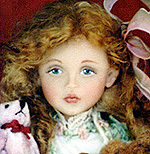 One of a Kind super Sculpey Cernit, blue painted eyes, blond mohair, 17" child with a 14" box. Two tiny sisters live inside the hidden children's room. 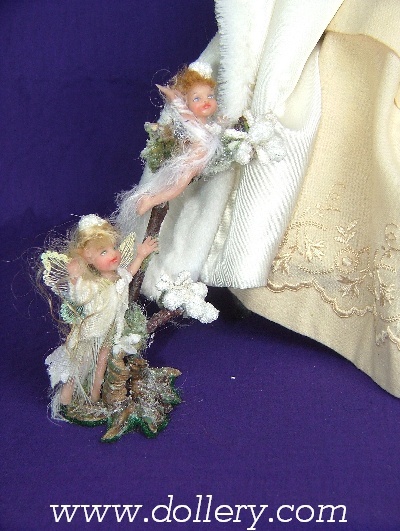 3" baby sister and big sister are dressed in lace and embroidered knits & have bendable wire bodies. Detail galore even a chamber pot under the bed! Window view is of Linda's backyard. Two tiny pictures of work Linda has done are inside lid of box. Comes complete as shown. 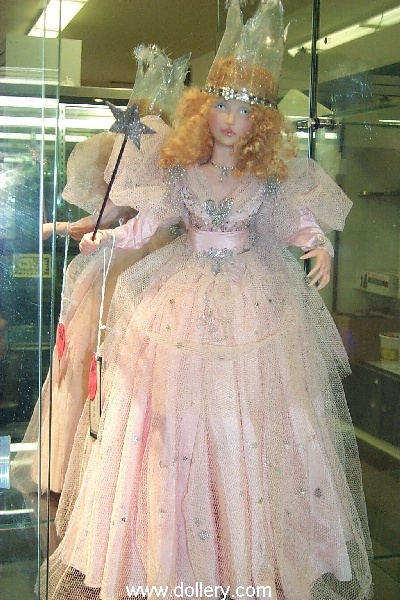 Linda Kertzman holding Wonderland Dreaming at our 2004 Doll Show! The Beauty sleeps on a beautiful handmade lounge decorated with an antique pale green lace coverlet and an eyelet pillow beneath her long burnished golden flowing hair! She is wearing a silken gown of peach with an embroidered bodice and top and has two extra flowing silken pieces draping down from her shoulders to the bottom of the lounge lace. 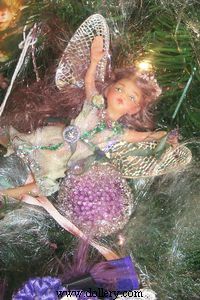 The fairy that is watching over her had golden blond hair and very fanciful wings, she is dressed in shades of green silk and shimmer that co-ordinates so well with the coverlet. $2,200.00 - SOLD Alice has 2 broken fingers on left hand. Super Sculpey & Cernit. Painted Eyes and Mohair. 20 inches total height. 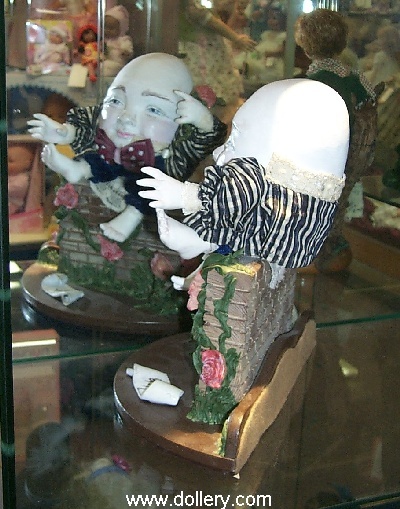 The Mad Hatter and Alice are looking down in surprise as the stack of books they are sitting on opens into drawers and characters begin to appear! Each character can be moved. The book display has been painted and embossed by Linda. All characters are hand sculpted originals. Alice is dressed in an antique blue velvet dress. Her antique light blue cotton and lace apron is accented with silk ribbon. She has a white eyelet slip and pantaloons. Her hair is accented with a blue velvet ribbon and a pink rose. 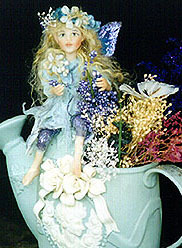 A tiny porcelain tea set with roses on a blue and white background is included. The Mad Hatter wears a huge antique blue velvet bow tie. He wears a white shirt and an antique pink and black polka dotted vest adorning old filigreed buttons. His pants are antique silk with velvet stripes. His black shoes and blue socks are topped by white high buttoned spats. 14" height, 9 1/2" width, 10" deep. Alice is dreaming of Wonderland and what it would feel like to slip through the looking glass. Linda custom made the Cheshire cat, baby pig, 2 tweedles, and the white rabbit for this special Alice. 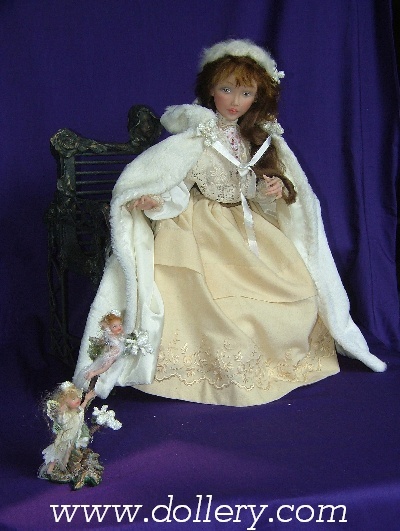 She comes complete with her dark rose brocade and antique cream lace wing chair. She is dressed in silky dotted swiss with a rose embroidered apron and rose silk sash. Super Sculpey/Cernit base of Magic Sculpt clouds. Blue painted eyes, Blond & white Mohair. 16 1/2 inches including base. This angel child is bringing her earthly gifts to share with those not yet lucky enough to run and play in such a glorious, peaceful place. She has so much to see and feel with each part of her soul she no longer has time to ply with her toys. Her draped dress is antique polished cotton hand stitched and formed into a pocket for her gifts. 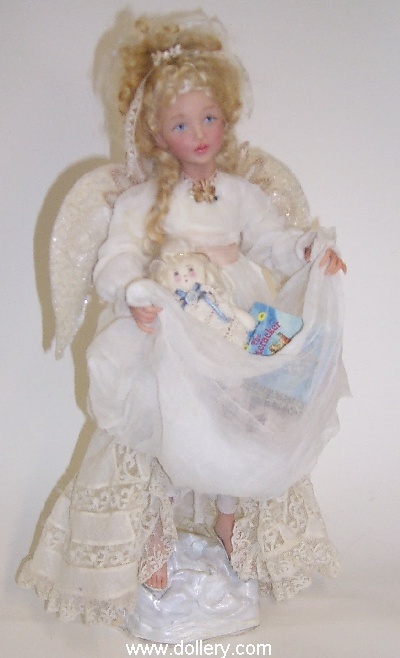 Inside she carries a handmade cloth angel dressed in lace, doll books and a handmade Bellawynd Bear. Her gorgeous antique beaded wings flow protectively from her back and she is decorated with antique silk flowers, lace and ribbon. 18 inches. She is adorned in antique fabric. Includes chair and little "doll." Dressed in warm brown silk velvet which works well with her golden hair. She wears pantaloons and slip to go with the more fall/winter colors. The baby is dressed in a beautiful antique cream/white silk velvet cape. Mother wears brown velvet and leather shoes. There is an antique flower to match the color of the antique lace bodice. Sorry, some pieces sold before I got a chance to photograph them. Really special! 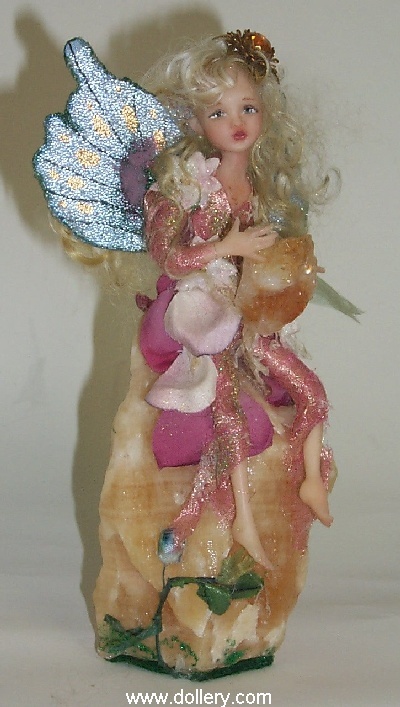 This stunning fairy has amazing positioning. Sold but similar sculpts can be special ordered. * You have to click on the photo to the left to see the amazing full shot of this piece! Really special! This storybook piece is amazing. Look at the attention to detail. To see more photos click picture to the left. This piece is sold. 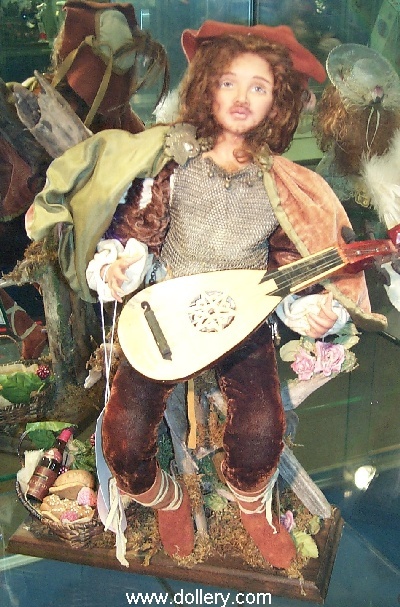 In some cases similar pieces may be special ordered. 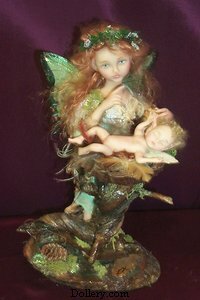 They will not be exact as each is a one of a kind sculpt..
$2,800.00 SOLD - Email kmalone@dollery.com * You have to click on the photo to the left to see the amazing detail in each piece of this magical story book piece! Really special! One of a kind. Brand new for 2002 show Advance Preview. Larger piece then she normally does. Taking pre-show order on this piece. $3,000.00 - SOLD - Call about similar pieces which may be special ordered in a smaller size, lower price range and with different themes. Linda has given us Exclusive rights to her Alice in Wonderlands as of 2002. Go to our last on-line show for more photos. Really special! One of a kind. Call about similar pieces which may be special ordered. Go to our last on-line show for more photos. Katherine Kim Eurasian Girl Wonderful! One of a kind. $1,398.00 - SOLD. Beautiful. Linda tried to keep her prices really reasonable at this year's show. $55.00 Each - these were limited edition resin pieces made for our show. Call on special ordering. Go to our last on-line show for more photos. Click on small photo to see full picture! Alice & The White Rabbit - Wonderful! One of a kind. 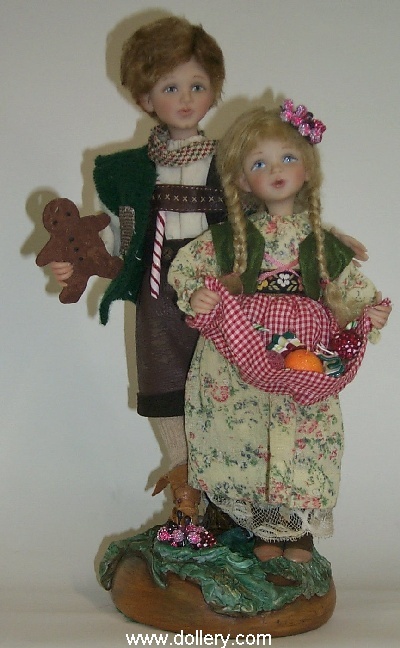 $1,698.00 - Dollery priced $1,498.00 - SOLD - Call on similar sculpts which may be special ordered. $2,200.00 - SOLD - In some cases similar sculpts can be special ordered but each is a one of a kind. Dorothy w/Toto, Cowardly Lion, Tin Man & Scare Crow - Wonderful! $1,298.00 - Great price! Available! Baby Bloomer Collection! Windy - Brand New! Just adorable! Baby Bloomer Collection! Danielle - Just adorable! Brand New! Look for her in Contemporary Doll magazine! $2,200.00 - SOLD Email kmalone@dollery.com for better photos. Many of these were sculpted after Victorian Postcard photos! Full length shot finally up! Click on face to get full shot! Blonde to left is the one available. If you like any of these dolls contact us regarding special orders. This may be possible. All are one of a kinds of course but similar themes are sometimes done by special request. This is just a sampling of the dolls we have sold. Many other one-of-a-kinds have been done especially for our store by Linda as she gives us first pick of her work.